Moving to Savannah – 10 Reasons Why You Should! Why on earth would anyone choose to move to the hot humid South? If you are considering moving to Savannah in the near future, make sure you read this article first! After all, you want to know what you’re getting yourself into, right? Savannah is a top tourist destination and people come here for a week’s vacation and end up falling in love with its spooky charm. But is moving to Savannah really right for you? As a transplant myself, I will give you my unbiased opinion of Savannah and the suburbs surrounding the downtown area. Also be sure to check out the affordability of Savannah Homes for Sale. You’ll see that compared to most other major cities, moving to Savannah and buying a home here is still extremely affordable. The good thing about the Savannah area is that it’s pretty big (geographically speaking) and there are plenty of places with totally different personalities to choose from. The bad thing about the Savannah area is that it’s pretty big and there are plenty of places with totally different personalities to choose from! I’ve written this article to help you figure out where to live if you decide that moving to Savannah is the right thing for you. Ok, so that’s kind of true. Except for the mint julep part. I’ve never had one, never even seen one on a menu anywhere. But mojitos? Mmmm…. don’t get me started on mojitos! I mean, look at this! Pretty cool, right? Savannah is on the river, it’s scenic, it’s got a funky artsy area, it’s close to the beach, there are several military bases nearby, it’s a college town, there are tons of places to play golf, and it’s driving distance to DisneyWorld. What’s not to love?! Before we get into our Top 10 Reasons for Moving to Savannah let’s get the boring stuff out of the way. So without further ado, let me tell you 10 reasons why moving to Savannah is a great idea! 1. Savannah is simply GORGEOUS! Picture this: It’s mid afternoon and the sun is high overhead. It’s hot but the canopy of trees arching over the street creates a “tree tunnel” that blocks out the heat of the sun. The moss dripping from the trees is something you just don’t see up north. Oglethorpe St. in Savannah on a typical day. I know – I spent the first 35 years of my life living in places where it snowed. A LOT. The Savannah River winds past River Street, past buildings that are more than 200 years old. The pace is relaxed, the atmosphere is happy, and everyone’s on vacation so no one is in a hurry. I can think of a ton of people who’ve said they originally came here on vacation, fell in love with the place, saw how inexpensive it was to live here, and immediately started making plans for moving to Savannah permanently. Want more water views? There’s a string of islands between Savannah and the outermost island, Tybee. You can buy property very reasonably priced on Wilmington Island or Whitemarsh Island. Tybee is the place to be if you want to live the life of a beach bum. So if you love the idea of living by the ocean, or gazing at the river and watching huge container ships floating past , you’ll see why so many people are moving to Savannah to escape the rat race (not to mention the snow) up north. According to the Georgia Department of Labor, the unemployment rate for the Coastal Georgia area is only 4.6%. There are lots of major employers that make moving to Savannah a distinct possibility if you can easily find a job here. The economy is thriving with new construction going in all around us. There are two major hospitals here, St. Joseph’s/ Candler and Memorial Hospital. Gulfstream Aerospace, the airplane manufacturer (rockin’ like a G6 ring a bell?) is a huge employer here with more than 5000 employees in Savannah alone. Hunter Army Airfield is a military base in Savannah and Ft. Stewart is about 40 miles southwest. A solid, healthy job market also is a great thing for home values. If you own a home in Savannah, and if we keep growing and growing like we have been, you’ll be on the winning end of a nice big chunk of equity. The Rincon area of Effingham County is attracting families like never before due to great schools, low home prices, lots of shopping and restaurants going in all around, and not much traffic. If you have school age kids and you’re thinking of moving to Savannah you should definitely check out Effingham County, Richmond Hill in Bryan County, or the islands if you want more highly rated schools. It’s funny to hear people who have moved here from New York or Philadelphia or another city talk about how “weird” we are in Savannah. Some people actually think it’s weird to smile at strangers on the street. And when I first moved to the South I will admit that I thought that too. After moving to Savannah, my husband and I were in our new neighborhood and we were taking our daughter to school that first day. Every person we passed, either walking their dog or driving the opposite direction, waved at us. Every. Single. Person. It WAS weird! I was not used to that at all. But now I love that everyone is so nice and welcoming. In fact, we just bought a new house in Rincon ourselves (due to the great schools and because you get so much house for the price) and within the first week that we were there I think more than half the people in the neighborhood had welcomed us to the subdivision. We have a standing “Friday night at the pool party for grown ups” where all the neighbors show up with music and drinks and socialize. Another example of how moving to Savannah can change your life for the better in so many ways! There’s a legend that pirates used to come to Savannah and wait for unsuspecting men who went to the pub and had a few too many drinks. When the men passed out, they got kidnapped and were taken through secret underground tunnels out to the Savannah River. The poor guys woke up the next morning out to sea on a pirate ship and suddenly found themselves with new careers as sailors on that ship! The Pirate House is a restaurant in Savannah that embraces its tawdry past and they’ll tell you all about it and even show you the tunnel. Take any of the haunted tours (my favorite is this one, where they drive you around in a hearse to give you a tour of the local haunts) and they will point out historic homes where ghost sightings have been reported. In its earliest colonial days, Wright Square (formerly called Percival Square) was used for public hangings. Ah, what a charming history America has! Are you into all things haunted? Ghost City Tours has a great write up on all the different haunted spots in town. But don’t let this keep you from moving to Savannah if the idea of ghosts wigs you out. Just live anywhere but in the actual city and you’ll be fine. Probably. Kidding!!! 5. Savannah Weather is Awesome! The average temperature in the dead of winter (December thru February) is in the 50’s. Now I am the first to admit that once you’ve left the snow belt and moved down south your blood thins pretty quickly. I will be in a winter coat and furry boots when it’s 50 degrees out! But there’s no shoveling snow and there are no snow days when school is cancelled for three days (sorry kids!) Moving to Savannah means you can probably ditch your gloves and scarves – for good! We sit on our screened porch every morning with a cup of coffee and most evenings with a glass of wine about 10 months a year. Then there’s the rest of the year. It’s a subtropical climate so it’s pretty mild most of the time. Spring and Fall are especially delightful here. I’m not gonna lie, July and August are HOT and humid, but you live by the beach so when it gets unbearable go to the beach for the day. We offer Virtual Reality House Hunting. It's a free service. Homes for sale in Savannah are some of the most affordable in the nation. You can actually still find a starter home in the suburbs with highly rated schools for less than $200,000. Don’t just take our word for it… Savannah is #9 on The Simple Dollar’s list of the most affordable cities to retire. Not sure which cities to consider? Check out this post, Cities Near Savannah. Planning to buy a home here but you live out of the area now? Don’t worry, we’ve got you covered. Read all about our newest offering, Virtual Reality House Hunting, which allows buyers to “visit” homes in virtual reality before moving to Savannah officially. Whether you’re searching for new construction in a great school district, an urban condo, a home close to Hunter Army Airfield, or a luxury beach house, you’ll find them all here for MUCH less than they’d cost in other coastal communities. How many people can say they live 20 minutes from the beach, yet their house only cost $250,000? Just don’t tell your friends in California since their houses cost three times that much. It’s not nice to make people jealous on purpose. To put our low cost of living in perspective, let’s say you now live in Boston and you make $80,000. Your house in Boston would cost $553,000 compared to Savannah’s $191,000, a $360,000 difference! So by moving to Savannah you could make more like $55,000/year and still have a better standard and cost of living. Savannah boasts a cost-of-living index score 17 points below the national average. The cost of living is slightly less than Grand Rapids, MI only you would never have to shovel your driveway again and you could buy fresh shrimp for $8/lb. from a guy on the side of the road on your way home from the beach every Saturday. There are quaint sidewalk cafes, 5 star restaurants, those with ocean views where you’ll see dolphins cavorting outside your window, and places owned by celebrities like Paula Deen. But one thing they all have in common? It’s casual dress all the time. Flip flops and sundresses are standard and if you’re on Tybee or Hilton Head, bathing suits with a cover up don’t even raise an eyebrow. I have literally walked into restaurants still wet from the ocean and even though I felt ridiculous the hostess thought nothing of it. I have my favorites, for sure, but there are SO MANY RESTAURANTS here that I could eat out every night for a year and still not hit them all. The Crab Shack – Tybee Island – Totally kitschy, amazing seafood and very reasonably priced, huge outdoor dining area with water views, super casual. It’s a tourist spot and yet, I love it and have been there a million times. Outdoor seating at The Crab Shack. AJ’s – Tybee Island – best she crab stew I’ve ever tried, and I’ve tried ‘em all. Crystal Beer Parlor – Savannah – Casual pub food, another one with great she crab stew. Wiley’s BBQ – Whitemarsh Island – Seriously the best BBQ ever. It’s a small place and fills up fast so come early. Schnitzel Shack – Rincon – Weirdest combination of menu items, yet it’s amazing! Mostly German food and beer with a handful of thai items thrown in. If you’re heading out to Effingham County you NEED to go here. The Schnitzel Shack’s bar – bring your own beer stein and leave it there for future visits! You better believe I have even more to tell you about, so if you want more recommendations for restaurants in Savannah, just ask! My parents told me they were moving to Savannah long before I ended up relocating here too, and they are true professionals at dining out. So if you need recommendations just ask! Jeez, now I’m hungry just thinking about this..
As mentioned before, Tybee Island is only about half an hour from the city. The South Beach is where the pavilion is with restrooms, snacks, shade, and a long pier for fishing. The North Beach is perfect if you want to see dolphins or hunt for shells. Three other beaches around the island are less frequented by tourists and therefore a lot less busy. With plenty of hotels and vacation rentals on the island, along with a plethora of restaurants, you can easily live the life of a beach bum here. In fact, one of my favorite things to do is an annual event called the Beach Bum Parade. It’s a parade where all the people on the floats have water cannons and the spectators all have water guns too! It’s held on a Friday evening in May every year and is really meant for locals, so it’s hilarious to watch unsuspecting tourists get soaked as they walk down the street! Want to see the Beach Bum Parade in action? https://youtu.be/_7hqHjPalxM I have a client who’s thinking of moving to Savannah from New York. He’s a first time buyer and has never been able to afford buying a house in New York due to the crazy prices and astronomically high property taxes (I’m talking $30,000/year.) His dream is to live close to the beach and believe me, I’m going to make it happen for him! I have yet to find a single person who doesn’t think this city is gorgeous. I mean, look at it! ‘Nuff said. Historic River Street, which fronts the Savannah River and has some of the oldest buildings in town. I took this out my car window – sorry I’m such a terrible photographer! If you love playing golf, moving to Savannah may be a very wise move! Technically it’s Hilton Head and Bluffton that have the majority of the golf courses that’s just a short drive over the bridge into South Carolina’s Low Country. Many people who love golf but also love the nightlife of Savannah prefer to live in Georgia rather than Hilton Head to take advantage of the shopping and nightlife, and to be close to medical facilities the military bases. Living on the Georgia coast, there’s an astounding assortment of private country club communities and public golf courses. Golf is a great reason for moving to Savannah. Heck, I’ll even take you out for your first round when you move here! I will warn you that my slice is impressive. I’ve been honing the technique for 40-something years now and I’m pretty good at it. Here’s a great article on improving your game through golf training exercises – someday I might actually take my own advice and try some of these. Bonus Tip #11. Savannah is very dog friendly! Spend an afternoon walking around the historic district and you’ll see people with dogs everywhere – at outdoor cafes, shopping on Broughton Street, playing in the parks… I even went to Whole Foods yesterday and there was a huge dog bed out front with a water dish so your pooch can stay outside in the shade while you grab some groceries. If you’ll be moving to Savannah your dogs will thank you for it! Whether you’re definitely moving to Savannah or are just considering it, as you can now see it really is a fantastic place to live, work, and play. You’ll never run out of things to do and it’s like being on vacation all the time with its friendly people and happy tourists. If you’re seriously thinking about moving to Savannah, or just have a few more questions before deciding, please don’t hesitate to contact me with any questions about the Savannah area. Still have questions about a potential move to Savannah? You can get in touch with me HERE, or shoot me a text at 912-417-9706. I can provide you with whatever information you’re looking for, or at least point you in the right direction. If you enjoyed this article, please consider sharing these “10 Reasons Why You Should Consider Moving to Savannah” with your friends via social media. Sharing is caring! 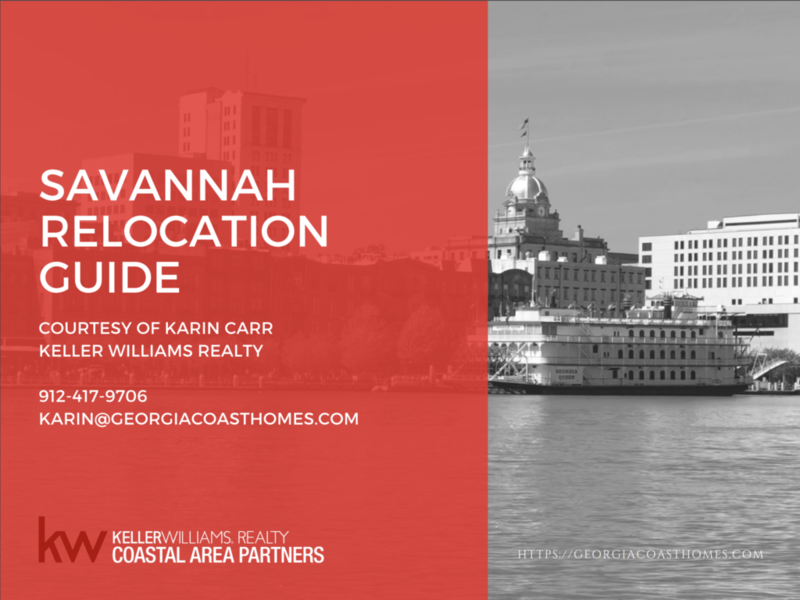 About the Author: The article above on Moving to Savannah was provided by Karin Carr, an authority on Savannah real estate and a leader in the field of real estate blogging. A frequent guest on Easy Agent Pro’s blog, Karin loves to use blogging, social media marketing, and all things techie to serve her clients and grow her real estate business. Karin has helped literally helped hundreds of families buy and sell homes across the country since 2005. I help people buy and sell real estate in the following north Georgia cities: Rincon, Pooler, Guyton, Savannah, the islands, Richmond Hill, and the surrounding areas. Thank you for reading Moving to Savannah – 10 Reasons why you Should!